This is a love story that depicts a whole new way of being a married couple. Hiro Kamon is 45 years old. Her charm and serenely beautiful smile endears many, who fondly refer to her as a �gbeauty that stands above the rest�h and �gthe ideal woman.�h But the truth is�c she despises people. As a result of her past, she has shut down her feelings and closed her heart. She had made up her mind. �gI will live alone forever.�h As fate would have it, a chance encounter with the man she used to love suddenly leads to marriage. Yet it turns out to be�c a fake marriage! They had the perfect ending after episode 8 but they added two more episodes which brought it down a little. 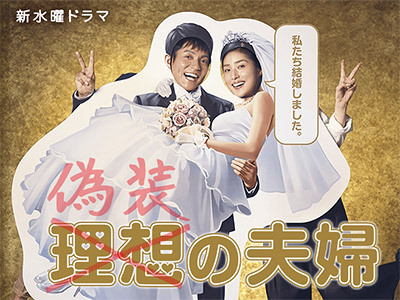 Still, a very good drama, Ikki Sawamura was great! Funny and heart warming drama!